Although relative unacquainted, the history of the Porto tram system is very interesting. The objectives of this site are to make better known the Porto tram and its history. On this site is information about the different types of rolling stock, the network, the lines, the depots, power plants and the museum. 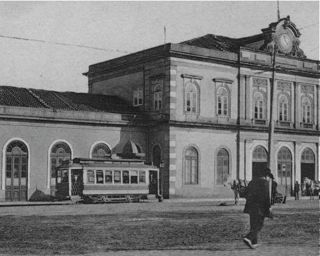 1874 (August 14th) - Opening of the first line of the Companhia Carris de Ferro do Porto from Praça Carlos Alberto to Foz (Cadouços) via Boavista and Fonte da Moura. Traction by mules. 1878 - Introduction of steam-traction on Boavista - Foz (Cadouços). 1893 (January 18th) - Merging of both companies. The new company taking the name of the Companhia Carris de Ferro do Porto (CCFP). 1895 (September 12th) - Start of the electric operation from Carmo to Arrábida. Power supply by a CCFP owned generating station at Arrábida. 1904 (September 22nd) - Terminating of the mule traction. 1912 - Introduction of route numbers. 1912 - Opening of the CCFP power plant at Massarelos. 1914 - Terminating of the steam traction. 1946 (July 1st) - The municipality takes over the system. New name: Serviço de Transportes Colectivos do Porto (STCP). 1948 (April 1st) - Introduction of the first motor bus line (Avenida dos Aliados - Carvalhido). 1950-1958 - The tram system had its maximum extension with 82 route km and 150 track km. 1957 - Closure of the power plant in Massarelos. 1959 - The first tramlines replaced by trolleybus routes. 1967 - The first tramlines replaced by motor buses instead of trolleybuses. 1978 - Tram and trolleybus services cease at 21h00. 1983 - Terminating of all tram services on Sundays. 1988 - Boavista replaced by Massarelos as running depot. Workshops retained in Boavista (also for trolleybuses and motor buses). Due to road-works, the trams returned several times to Boavista: March - July 1991, June - November 1998 and February - May 1999. 1992 - Opening of the tram museum in Massarelos. 1996 (June) - Tram services on the only remaining line (18) restricted to 9h00 - 19h00. Working on Sundays reintroduced. Only 3 tramcars provide a 35 minutes frequency. This can be considered as the start of the heritage tram system. 1997 (December 27th) - Closure of the last trolleybus line. 1999 (August) - Scrap of the Boavista depot. 2002 (December 7th) - Opening of the first line of the Metro do Porto: Trindade - Senhora da Hora - Senhor de Matosinhos.